There are so many gadgets to carry around that it starts to become annoying figuring out which cable goes to what. Everything needs to be charged almost daily, and even though we try to keep things neat and simple, that isn’t always the case. As our lives become busier, it’s hard to keep tabs on our health, which is why activity trackers are becoming more and more popular. However, the drawback with those is that they are oftentimes very noticeable when you’re dressed for work. If you want something that isn’t going to stick out like a sore thumb, the Goccia might be the answer. This is the world’s smallest activity tracker that is made of tempered glass and aluminum. It’s about the size of a shirt button, and is very easy to use, charge, and sync. It’s 100%waterproof, which means you can use it while running, cycling, swimming, sleeping, and more. You can set goals for yourself, and keep track of them through 8 LEDs that are on the face of Goccia. This is tailored for iPhone or iPad users, and can be worn as a necklace, bracelet, or clip. 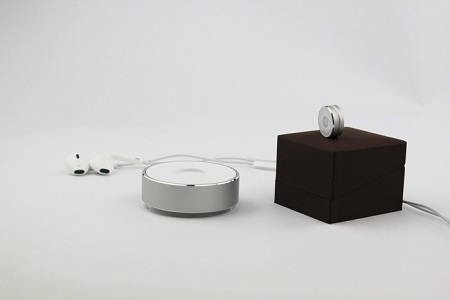 It can hold a charge for 14 days, and juices up wirelessly. Syncing is simple in that you only need to place it over the camera of your iDevice, and it will transmit all the important data. There is talk of making this accessible for Android and Windows, but that isn’t available at the moment. Getting Goccia, a wristband, clasp, and necklace accessory will cost anywhere from $95-200.